App for Aquarena Education now available free. 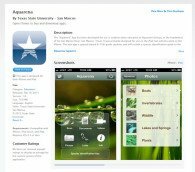 The “Aquarena” App was developed for use in outdoor water education at Aquarena Springs, at the headwaters of the San Marcos River, San Marcos, Texas. It was primarily designed for use on the iPad, but will also work on the iPhone. The new app is geared toward K-12th grade students and includes a species identification guide to the common fish, birds, plants and animals that inhabit the springs, wetlands, and adjacent watershed. The app will be available for download by visitors to Aquarena Springs, operated by the River Systems Institute, Texas State University. Organized groups may be provided iPads for educational purposes. Researchers at Texas State’s Meadows Center for Water and the Environment are using new technology-enhanced ways to connect students with water. The new App and other technology enhancements are being designed specifically to allow for instruction and research in outdoor education in the unique environment of the San Marcos springs, which includes an entire watershed immediately adjacent to the springs, a wetlands education area, a lake, and a headwaters river. The ‘Scan’ module enables the ‘Aquarena’ app to read a ‘QR-Code’ (Quick Response Code). These codes could be setup to show videos, display images or play sound clips. The ‘documents’ module of the app will list the available documents found on the server (online only), or list the available documents within the application itself (offline only). The ‘videos’ module of the app will list the available videos found on the server (online only), or list the available videos within the application itself (offline only). The ‘photos’ module of the app will list the available photos found on the server (online only), or list the available photos within the application itself (offline only). The ‘links’ module of the app will list the available links found on the server (online only). The ‘info’ module shows information regarding ‘Aquarena’ and the application, as well as the credits for the development of the application. You can also contact (email) Aquarena from this module. The ‘Scavenger Hunt’ module offers a fun and unique method of allowing the user of the app to locate and take pictures of various points of interest along the Aquarena trail. A photo journal is kept so that the student can review their tour when they return back to the River Center. By making a file change on the server, access to certain app modules can be temporarily ‘locked/unlocked’ at will, enforcing remote control of app functionality!